Robert Juliat followspots continue to enjoy enviable careers, travelling the world on tour with some of the biggest musical artists. Recent press reports have spotted them with Robbie Williams, Ed Sheeran and rock and roll bad boys, Guns ‘n’ Roses. Now we see Robert Juliat Lancelot and Victor followspots turn their attention to Adele and Phil Collins with lighting designers Patrick Woodroffe and Roland Greil, both of Woodroffe Bassett Design, specifying them for Adele’s Live tours in 2016 and 2017, and Phil Collins ongoing Not Dead Yet tour. “The designs for Adele’s arena tour in 2016, for which Adam Bassett was the associate lighting designer, and her stadium tour in 2017 were completely different from each other. The former was based upon a very symmetrical lighting rig that was all about creating a good-looking picture frame with Adele as the centre of attention in the middle. We kept the colours muted with 80% of the lighting being different shades of white, with a few shades of blue and very little else. “For the indoor arena tour we used two Robert Juliat Victor 1800W followspots as truss spots because there was not a lot of movement on stage: Adele’s biggest move was from the main stage to the B-stage and back again, so the spot call was easy and the Victors were perfect for our needs. 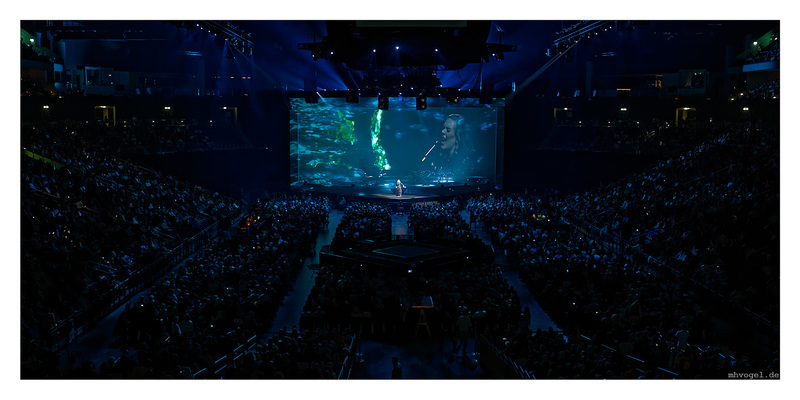 They were reliable and bright and easy for the operators to handle – just what you would want and expect from a followspot - and performed well for all 120 tour dates.” Woodroffe was later to receive a Knight of Illumination award for his design for Adele Live 2016. For Adele’s 11-date international stadium run this year, the design shifted to a circular stage and in-the-round setting to give maximum viewing for the huge audiences who packed the stadiums. Woodroffe and Greil chose four of Robert Juliat’s 4kW Lancelot followspots, each of which was positioned in the middle of the four stands so the world-conquering artist could be covered from all angles. “The varying throw distances were immense but the Lancelots were able to cover them easily,” confirms Greil. Woodroffe and Greil continue to specify Robert Juliat with the appointment of two more Lancelot followspots operating from front-of-house positions on Phil Collins’ Not Dead Yet mini-tour. The tour marks the publication of the ex-Genesis lead singer/drummer’s autobiography of the same name, and the return of the multi-award winning artist to live performance after a break of ten years. The Lancelot followspots have highlighted the veteran singer’s talents at 12 arena shows this summer from Cologne to Paris, and at the Aviva Stadium, Dublin, before headlining at Barclaycard’s British Summer Time in London’s Hyde Park in June. The tour is set to continue with more UK dates coming up in November, including two rescheduled dates at the Royal Albert Hall in London, with Robert Juliat Lancelots in support all the way. Robert Juliat is distributed in the UK exclusively by Ambersphere Solutions. The lighting supplier for both Adele Live tours and Phil Collins Not Dead Yet tour was renowned UK-based lighting hire company, Neg Earth Lights.